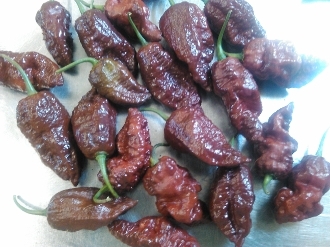 The Chocolate Bhutlah was created when a Chocolate Bhut Jolokia & a Douglah were crossed! A VERY VERY VERY mean looking pepper, and one that has hints of smoky flavor. There will be 20+ seeds per pack!! It will mature from green to chocolate/brown in color. It grows from seed to harvest in aprox 165 days! Order yours TODAY!! !